Hello followers! I'm just checking in from the AWP conference. I don't have much time to blog. I actually decided to attend very last minute and didn't have time to put together any posts ahead of time. Right now I should be editing my manuscript since I have a submission due tomorrow, but here I am blogging, because I couldn't stay away from all of you! I'm having such a great time! 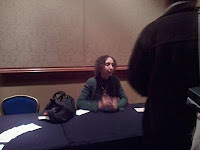 I've met Joyce Carol Oates, who is my writer idol (like the picture?). What an inspiration she is. Hearing her today has been a big eye opener, and I've had just about a million revelations. I won't bore you with all of those, but let's just say I can't wait to get home and get to work. I've also met Sapphire and Mary Gaitskill, which was also a huge honor. The panels have also been great (well some of them anyway). I attended one this morning called "Race in the Creative Writing Workshop." It blew my mind. An African American student disclosed that her southern MFA program told her that they would not discuss her characters in workshop because of their ethnicity! I can't believe things like that are still going on. I was glad I chose that one because I learned so much in just an hour and fifteen minutes. I also attended a workshop where editors and agents shared the best practices for securing publishing partners and another today on the art of rejection. I'll be posting the scoop on both of those next week. Also, I just realized I forgot to put a deadline on the contest. It will close on February 18, 2011 11:59 pm. I'll go back and add that to the post. It sounds like a great experience. I like attending conferences of this nature because one can learn so much, and in turn meet interesting people. Continue to enjoy it and tell us all about it when you get back. It sounds like you are having an amazing time! I am so jealous!! I know that you are learning so much and I look forward to hearing more about it in the future! 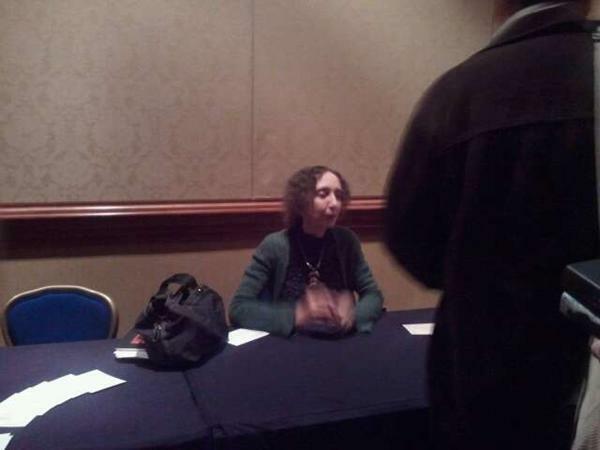 So Jealous that you met Joyce Carol Oates! Sounds like a great conference and I'm looking forward to hearing some of your revelations. Sounds great! The session on race sounds fascinating. I can't believe that student had that experience in an MFA program! Looking forward to hearing more about it when you're back! Wow, it sounds like you're having an AWESOME time! Wish I could be there with you, but I like reading your recaps on Twitter and here on the blog. :) Keep enjoying yourself--can't wait to read more!